I love industry tell-all memoirs. This one focuses on the hotel industry and the insider secrets learned by Tomsky during the years he spent working in hotels. He combines the story of his years with the industry with tips for hotel customers from an industry worker's point of view. He's also got tons of great, gossipy stories about the horrible behavior he's seen and the scandals that take place behind the scenes. I think the writing was average. I wasn't blown away by anything in particular and there was nothing that stood out as original or unique. But there were also no issues for me in terms of quality. Standard memoir fare. I really identified with the author and how he accidentally fell into the hotel business. He offers some great travel tips, but the highlight to me in this type of book is always the "tell-all" aspect. I love hearing about the appalling behavior from customers and the corners that are cut behind the customers' backs. If you like tell-alls, if you travel a lot, or if you have some kind of particular interest in the hotel industry, this is a great book to read. 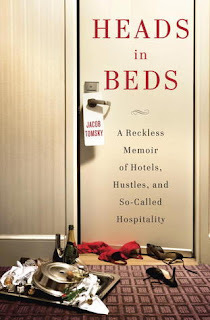 It definitely works as an industry memoir, but it might not appeal to those who are looking for a more personal story as Tomsky's personal life doesn't play a huge role in the book. I bet this is an interesting read, but hope it doesnt prevent you from wanting to travel. Sometimes I enjoy tell-alls but sometimes ignorance is bliss :) Thanks for sharing your thoughts. This book isn't so much a tell all as it is a mash-up of a "10-things-they-won't-tell-you" lists, "Waiter Rant's" pissy attitude, and some of the good ole "look-at-me-I'm-serving-rich-people" melodrama thrown in for good measure. Nothing special or spectacularly revealing here.